SINGAPORE - Marina Bay Sands (MBS) and Resorts World Sentosa (RWS) have committed $9 billion in investments to expand their integrated resorts (IRs). In a joint release by four Government ministries on Wednesday (April 3), several key developments - such as the first expansion to Universal Studios Singapore since its opening in 2010, and a fourth tower at MBS - were announced. Here are eight things to know about the changes to Singapore's IRs. 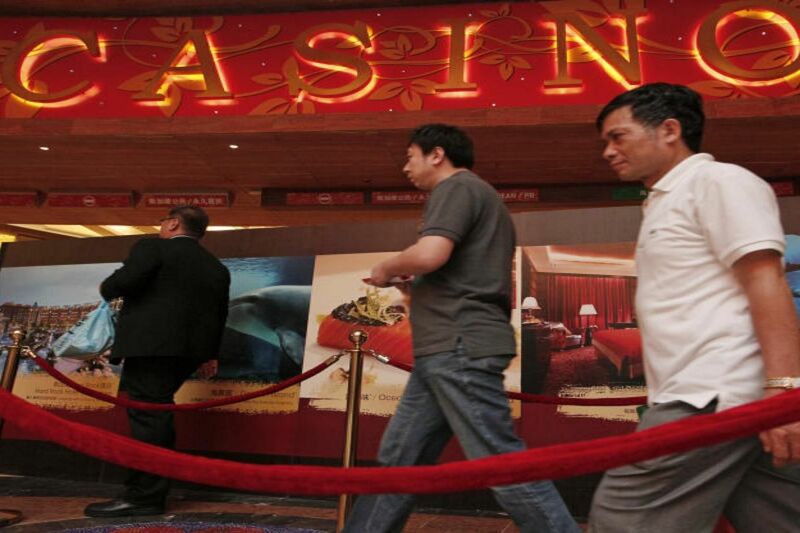 Singapore citizens and permanent residents (PRs) looking to enter the two casinos will have to pay higher entry levies from midnight on Thursday. The entry levies will be raised by 50 per cent and take effect after 11.59pm on Wednesday. This means that the daily levy, which is valid for 24 hours, will increase to $150 from $100. The annual levy will cost $3,000, up from $2,000. The pre-payment and auto-activation windows for all entry levies will be shortened to six hours with effect from Aug 1. In view of the investment committed by the two IRs, the Government has agreed to extend the exclusivity period of the two casinos to end-2030. No other casinos will be introduced during this period. MBS and RWS have also received the go-ahead to expand their casino areas. Each IR is currently allowed 15,000 sq m of gaming areas. Subject to payment of additional land costs, MBS and RWS will be able to expand their casino areas by 2,000 sq m and 500 sq m respectively. Should both IRs exercise their options fully, the total gaming area in Singapore will increase from 30,000 sq m to 32,500 sq m.
However, the expansion of non-gaming areas means that the space taken up by gambling operations at the two IRs will fall from the existing 3.1 per cent to 2.3 per cent. From March 2022, the two IRs will have to pay higher casino tax rates under a new tiered structure. Under this structure, premium gaming will be taxed at 8 per cent for the first $2.4 billion of gross gaming revenue, and 12 per cent for gaming revenue in excess of $2.4 billion. Mass gaming will be taxed at 18 per cent for the first $3.1 billion of gross gaming revenue, and 22 per cent for any excess revenue. Currently, the IRs pay 5 per cent tax on premium gaming and 15 per cent on mass gaming. RWS has planned about 164,000 sq m of new attractions for its expansion, which will be gradually rolled out every year from 2020 and completed around 2025. 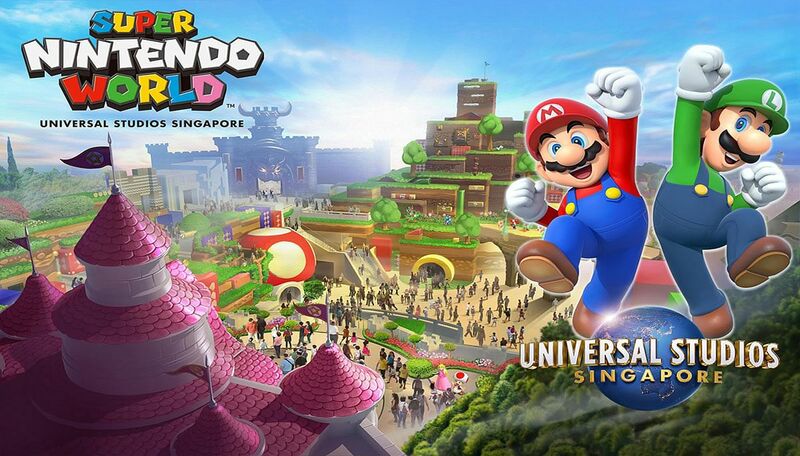 Two new themed attractions, Super Nintendo World and Minion Park, will mark the first expansion to Universal Studios Singapore since its opening in 2010. The new Minion Park will replace the existing Madagascar area. Two new hotels with a capacity of around 1,100 rooms are expected to be added to RWS as well. Among the highlights of the developments planned for MBS include a state-of-the-art 15,000-seat arena, a luxury hotel tower and additional exhibition space. The hotel tower will feature around 1,000 all-suite rooms and a sky roof with a swimming pool and a restaurant. Architect Moshe Safdie, who designed the original MBS property, is expected to involved in the design of the new building. The projected budget for the expansion is approximately US$3.3 billion (S$4.5 billion). Following the opening of the two IRs in 2010, Singapore saw an increase of almost 2 million international visitor arrivals. 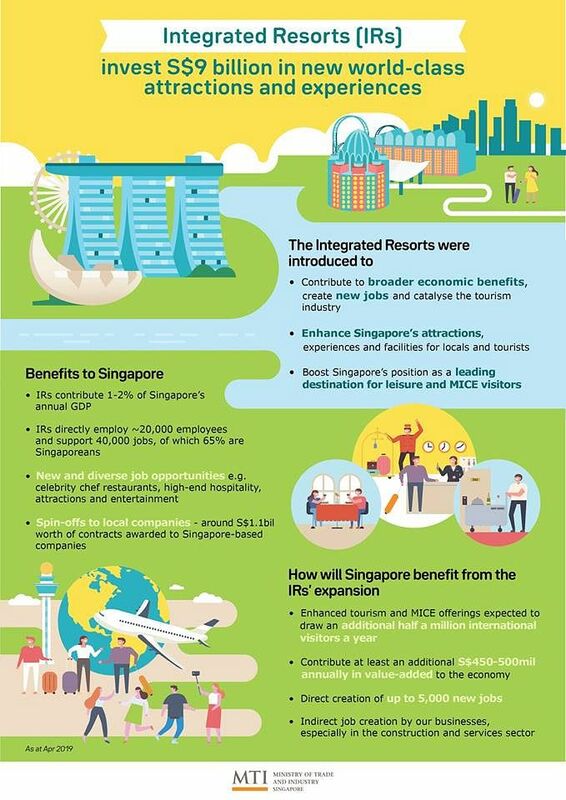 The new developments to MBS and RWS are expected to draw about 500,000 more international visitors annually, who will contribute around $500 million to Singapore's gross domestic product (GDP). With the expansion of the IRs, around 5,000 new jobs will be created. Around two-thirds of these jobs are expected to be filled by locals. More job opportunities, especially in the construction and services sector, will also be created indirectly. The IRs currently employ about 20,000 people directly, more than 65 per cent of whom are locals.